This half term we have decided to explore all that Northumberland has to offer. 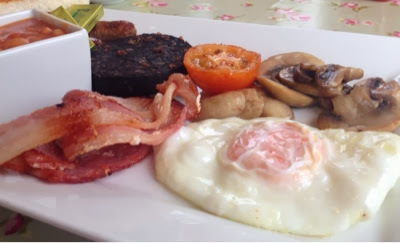 What better way to start our week than a hearty Northumbrian breakfast at Sunnyhills Farm Shop in Belford. 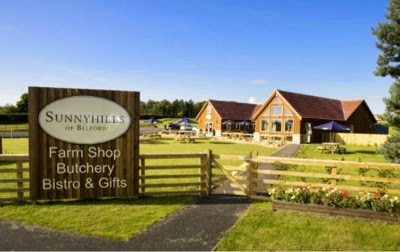 Sunnyhills is located just minutes away from the A1 so is a perfect place to stop whilst exploring the area. 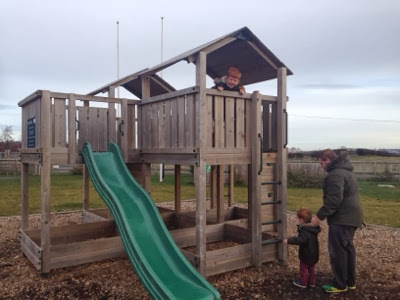 This was our first visit to Sunnyhills and we were very impressed when we pulled into the ample car park to see that their was a lovely children's play area outside. 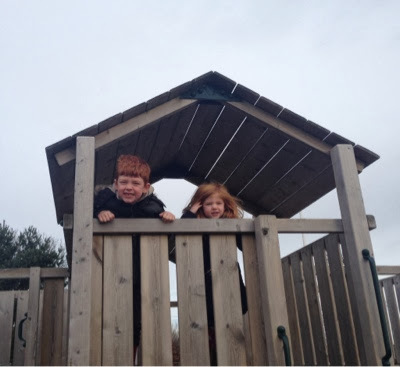 You can buy takeaway style hot drinks from the cafe and enjoy outside on the picnic tables whilst the children play. 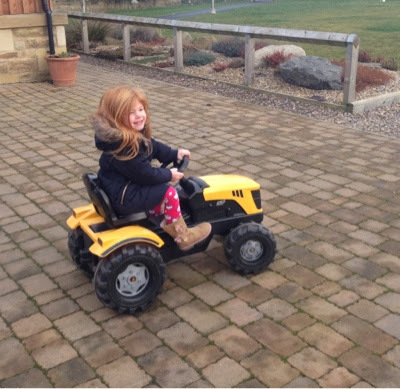 There was also a range of tractor and car ride ons to enjoy which our children loved. The grounds are absolutely immaculate and there are lovely countryside views to enjoy. It certainly does not feel or sound like the A1 is just a few minutes away. We eventually managed to tear our children away from the play frame and ventured into the cafe. 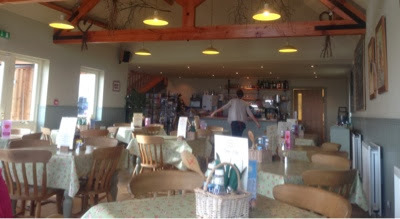 This is probably the nicest farm shop cafe we have ever been in. The tables are covered with beautiful Kath Kidston style cloths, there is a range of seating (with lovely unique cushions), it is bright and airy with lots of light and fantastic views and there are local photographs on the walls which provide interest and are available to buy. 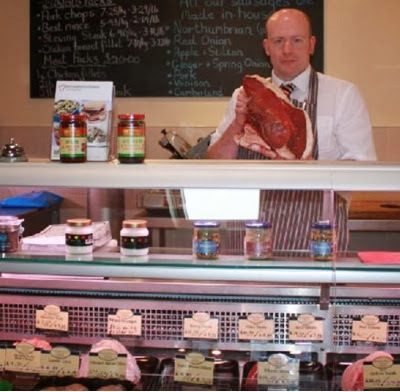 It is table service at Sunnyhills which is unusual for a farm shop. It was welcome though and all of the staff were friendly, polite and attentive. Everything on the menu sounded delicious. 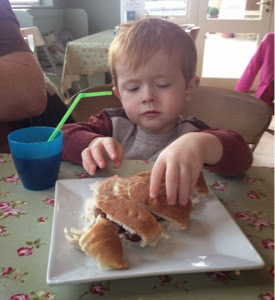 I opted for a quarter stottie filled with sausage and bacon, our boys decided on a quarter stottie filled with sausages, Heidi decided on fried eggs on toast (her favourite) and hubby could not resist the full works and ordered the full English. 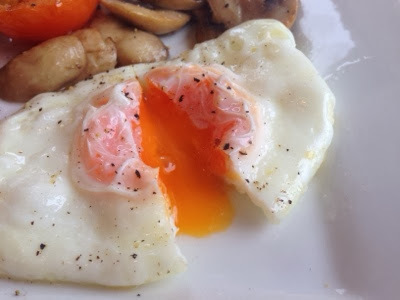 I was pleased to see that locally sourced food features heavily on the menu including free range eggs straight from the family farm. The bacon really stood out for us and this is cured in house by the farm's butcher Paul and always sourced from a farm in Northumberland. All of our food was fantastic and nobody left so much as a crumb! We all agreed it was one of the best breakfast's we've had in a while. At one point during our meal everyone was silent and simply enjoying their breakfast which I have to say is a complete first! There is a nice range of children's drinks on the menu, we were envious of the table next to us who all ordered hot chocolates. They were topped with lots of mini marshmallows and looked amazing! Definitely something to try next time. 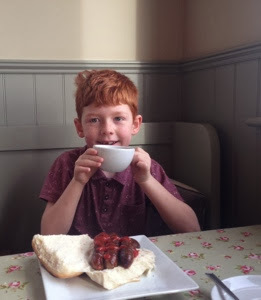 Our 7 year old loves a cup of tea as a treat when we enjoy breakfast out. He couldn't manage a whole pot himself but the staff had no problem in simply bringing him an extra cup so he could share his dad's pot of tea which was nice. After our breakfast we had a quick browse of the attached farm shop which included a butchers, deli and lots of locally sourced food. There is also a gift shop selling a wide range of local and interesting gifts including toys for children. 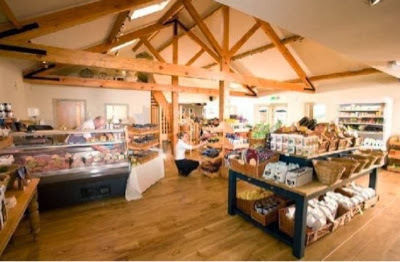 You could easily spend a few hours at Sunnyhills farm shop. They also serve lunch and snacks daily and a Sunday lunch that has been recommended by others (booking advised - visit website for details). 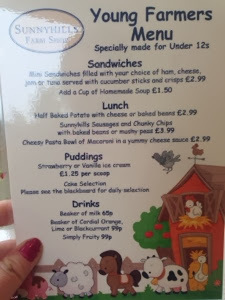 Sunnyhills is very family friendly with lots if highchairs available and a children's menu which is very good value. They hold various events throughout the year and can't wait to return and enter the Easter egg decorating competition in April (check website for details). 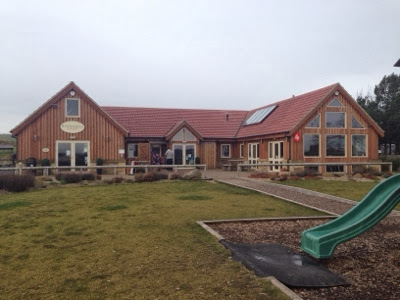 Next time you are looking for somewhere to spend a few hours with the kids where you can enjoy fresh air, excellent food and pick up a few treats from the farm shop, I would definitely recommend you pay Sunnyhills in Belford a visit.